This week’s Flash episode is brought to you by the letter E for Emotions. Who has them, who doesn’t and how much does it matter? Clifford DeVoe is back in his original packaging, but Marlize quickly learns that all is not as it was. Absorbing Ralph’s abilities may allow DeVoe to expand his mind with no ill effects, but the additional dark matter has erased whatever emotions he had left. Marlize is ecstatic that the husband she recognizes has returned to her. For his part, Clifford may be pleased he no longer needs to dose her with the Weeper’s tears, but her desire to get reacquainted is a distraction from their (read: his) ultimate goal. To DeVoe, emotions are inconsequential nuisances next to his intellect. DeVoe can barely notice it in others much less acknowledge its worth. Barry may recognize emotions, but he’s doing his damnedest not to feel them. Ralph’s death has hit Team Flash hard yet Barry seems unaffected. Barry’s dealt with death numerous times and has come to terms with it, or so he tells Dr. Finkel. Like DeVoe, he believes that emotions will only get in the way. Needless to say, they are both wrong. Barry can pretend that he’s fine but the truth will out. He suppresses his grief so he can focus on protecting his team and defeating The Thinker. He recruits Earth-X’s version of Leonard Snart in the hope that Leo is something DeVoe can’t predict, unknowingly bringing Earth-X’s Siren along for the ride. Leo, an experienced leader, calls Barry out immediately. If Barry will not face his grief openly he runs the risk of it emerging when Barry is unprepared to deal with it. This is borne out when Barry and the rest of Team Flash are transporting Neil Berman AKA Fallout from Tracy Brandt’s lab to A.R.G.U.S. DeVoe arrives and taunts Barry with Ralph’s memories. Barry freezes, and when Siren-X arrives, he is unable to stop her from capturing Fallout, Caitlin and Joe. DeVoe is livid. This was not part of his plan. Marlize is quick to point out that DeVoe’s disregard for the emotions of his foes may be affecting his ability to anticipate their actions. He worries she may be right. However, when Borman arrives at DeVoe’s predicted location, he dismisses Marlize’s assessment. In fact, he dismisses Marlize’s value as anything other than a tool in service of his goal. This is not lost on her. DeVoe won this battle, but the war is far from over. Unlike DeVoe, Barry eventually acknowledges his grief. He breaks down, explaining to Joe that he failed Ralph and is responsible for his death. Barry even goes so far as to schedule an additional session with Dr. Finkel to address his feelings. The rest of Team Flash are dealing with their own losses. Caitlin, only recently coming to terms with sharing her body with Frost, is grieving her absence as much as the rest of the team is grieving for Ralph. Unlike Ralph, there is a chance they may get her back. As we have seen throughout the season, Harry believes the only thing he brings to Team Flash is his intellect, which was never a match for The Thinker’s. Now even that intelligence will vanish, but he can’t bring himself to tell anyone of his failure. Cisco, oblivious to Harry’s fate, is convinced they may have saved Ralph if they hadn’t taken the Intelligence Booster away from Harry. In his guilt, Cisco pressures Harry into building a Thinking Cap for him. It fails. Whether Harry deliberately sabotaged it or his failing intelligence is to blame is up for debate although I believe the former. After Caitlin and Joe are taken by Siren-X Cisco redoubles his effort to complete the new Thinking Cap. Harry destroys it and confesses everything to Cisco but refuses to tell the rest of the team. Yet. Neil Berman eventually made it to DeVoe’s chosen destination. What’s so special about this location? Wouldn’t grabbing Berman from Tracy’s lab have been easier than an A.R.G.U.S facility? Is there something else he needs at that specific location? And what does he need Berman for? Will he absorb his abilities or will he serve a different purpose like The Weeper? DeVoe’s lack of emotion has become a weakness along with his inability to recognize it in others, particularly his wife. I’ve made no secret about my belief that DeVoe cannot succeed without Marlize by his side. I wonder if this is the moment that eventually sends her to Team Flash. Dark matter may have caused Frost’s appearance, but she was part of Caitlin’s DNA, to begin with. Is this different from the other metahumans or are they all genetically predisposed? If there is a genetic marker for them will they be hunted down a la X-Men or Inhumans? Ray and Leo are getting married! Something good happening on Earth-X. Go figure. Barry’s empathy is one of the many reasons he’s a good leader, and it is one of the few advantages he now has over The Thinker. I have no idea where the Powers That Be are going with this, but they just spent an entire episode highlighting its importance. Curiouser and curiouser. So have Barry and Iris been seeing Dr. Finkel regularly or did Iris push Barry into visiting her? I thought it was the latter but Iris’s comment about the same time next week suggests otherwise. Even on Earth-X Laurel doesn’t get her man. I almost feel sorry for her. Iris sends Leo to talk to her husband when he froze in the field. That is the mark of a good leader. Why isn’t Laurel affected by Fallout’s radiation? Supposedly, this is Wentworth Miller’s last season as Leonard Snart yet he was given an inter-dimensional extrapolator a la Supergirl. Does this mean that plans have changed? One can only hope. 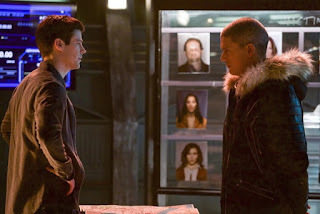 Snart: “So, you’re trying to stop a guy who thinks he’s smarter than everyone and his true-believer lover, who are hell-bent on achieving their evil machinations at any cost. Well, it’s right up my alley." Snart: “It must be happy hour, and I’m the two-for-one." Snart: “If I die before Ray and I get married, Ray will kill me." Snart: “Oh, just your typical deadly combat between two metas from multiple Earths." Cisco: “A Nazi Laurel Lance just kidnapped Caitlin and Joe. We’re going to make this thing work, and we’re going to make it work now." Harry: “My only job is to be smarter than all the villains that want to hurt this team. And without that, I’m nothing." DeVoe: “I calculated everything. The Flash’s involvement with the bus-meta, the recruitment of Snart’s doppelganger, even the arrival of the Earth-X banshee. Every event occurred exactly as I predicted. Except the outcome!" Barry: “Grief is a luxury I don’t have time for. There's no question. Everything is better if Wentworth is in it.